My husband Charles and I have owned our unit at The Pearl of Navarre Beach since January of 2004. 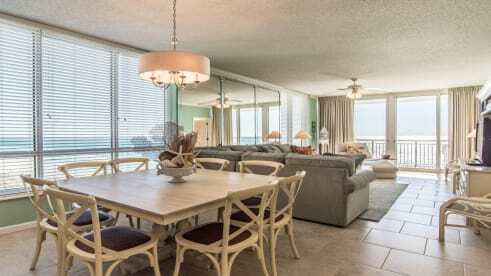 We looked at many properties for sale along the Florida Panhandle and felt most at home and comfortable at the Pearl. It truly is our second home and our three children (now adults) still love it and we look forward to the time when we have grandchildren who can enjoy it too. We decided from the beginning to rent our unit to cover some of the costs of owning but we found we really enjoyed sharing our unit with others. We have loved reading your comments in our guest book as well as the reviews we received on our VRBO listing over the last 13 years. We have continuously updated the condo including new quartz counters in the kitchen and wet bar, a new sectional sofa sleeper, new dining furniture and new mattress in the master bedroom. We hope you enjoy our condo as much as we do!